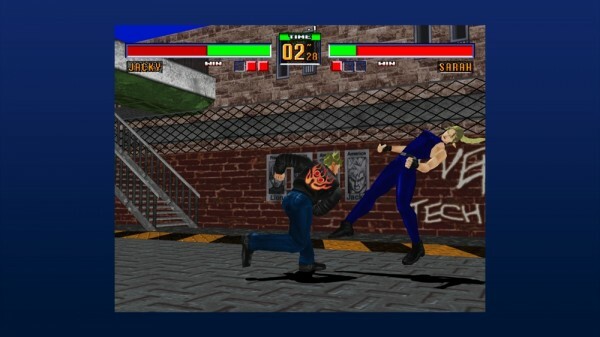 The original Virtua Fighter game is widely regarded as the true origin of the 3D fighting genre. From a graphical and technological standpoint, it did things no other game dreamed of doing at the time. It may look like a laughable blocky mess now, but back then, these character models and fighting animations looked really realistic (not that people were blocky polygons back in the 90s). It didn’t just rely on this ground-breaking engine (which was powered by the primitive Sega Model 1 arcade system board), as it also provided a fighting experience completely unlike contemporary (2D) fighting games from that time. There were no fire balls or grotesque mutilations, as it instead attempted to offer a realistic fighting simulation, featuring real world fighting styles that were animated and choreographed with a great deal of accuracy (for its time at least). 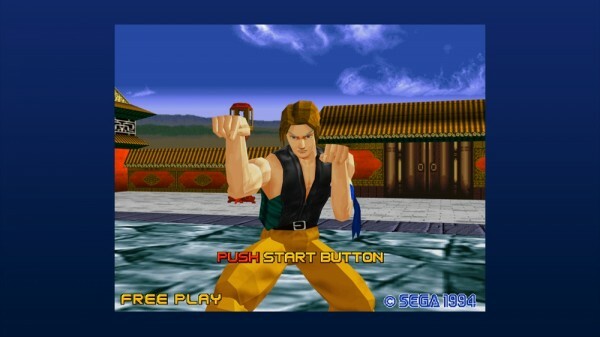 As influential and important this release is still regarded to be, it wasn’t until the second game that the Virtua Fighter series really shot to gaming stardom. 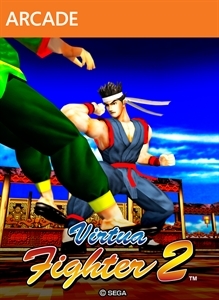 By the time Virtua Fighter 2 came around, Sega had already developed the far more powerful Model 2 technology, and as a result the second game ended up going leaps and bounds ahead of the debut title in all respects. 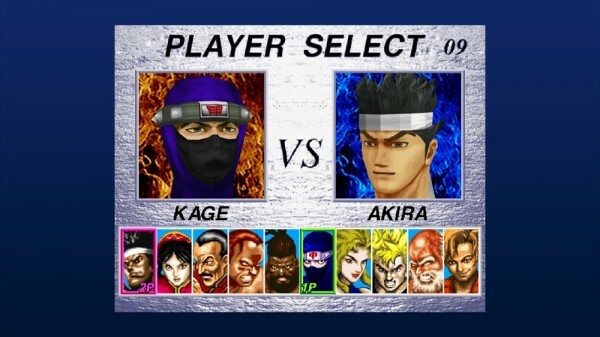 The gap between Virtua Fighter 2 and Virtua Fighter was simply astounding. It was almost as if the first game was an in-house alpha build for Virtua Fighter 2. 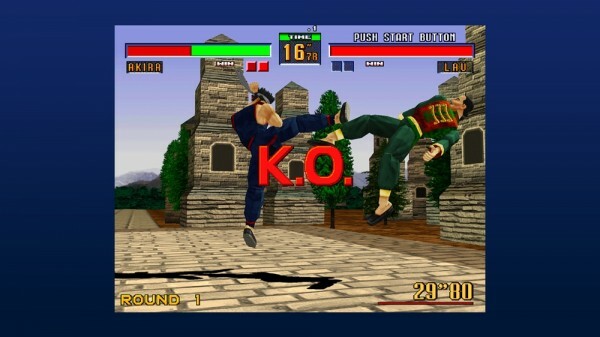 Virtua Fighter 2 did for the 3D fighting genre what Street Fighter II did for 2D fighting. It’s a game that really set the benchmark, and became the gold standard to beat. It laid the very foundation for modern 3D fighting games, and its influences can still be experienced in recent blockbuster fighting releases like Dead or Alive 5. While subsequent Virtua Fighter titles have evolved the template over the years, more recently with Virtua Fighter 5: Final Showdown (released this year), the fact of the matter is that the series truly struck gold with Virtua Fighter 2. From a mechanical, gameplay, and technical standpoint, it is simply timeless. In the same manner that Street Fighter II continues to have a place in the current gaming landscape, a game like Virtua Fighter 2 also deserves to be recognised and celebrated, not simply for nostalgic reasons, but on the basis of its merits. A smash arcade hit, with an even more successful Sega Saturn port, now comes to digital platforms with a HD coat of paint and a fully functioning online mode. In the recent trifecta of Sega AM2 fighting releases (which included Fighting Vipers and Sonic the Fighters), Virtua Fighter 2 is easily the best one. It’s pointless to criticize the graphics of a game that is over a decade old based on current standards, so instead I’m going to put things into a more appropriate context. During it’s time, Virtua Fighter 2 was the best looking and performing fighting game. It was a game that would squeeze every drop of potential that the Model 2 technology offered, in order to create one of the best technical, and graphical, showcases of that era. The amount of detail in the polygons, the fluidity of the animation, the frame-rate, the hit detection and collision, and everything about the graphical and technical prowess of Virtua Fighter 2 resoundingly surpassed its competition. If you have a swing at any of the old selection of 3D fighting games from that time (games like Tekken 2, Tekken 3, Dead or Alive, Bloody Roar, and Soul Edge), you’d be hard pressed to find anything that looks as good as Virtua Fighter 2. The character models may look blocky now, but they look amazing considering that this really was the peak of that particular technology. Not only that, but they animate with a great deal of precision and fluidity, performing real world fighting styles with sound realism. Every movement, every attack, every strike, is just so well defined and well executed. While many 3D fighters from that time suffered from awkward clipping and weird polygon collisions, Virtua Fighter 2 had an unmatched level of polish. Above everything else, Virtua Fighter 2 still has the best frame-rate compared to 3D fighters from that time or even today. It runs at a blistering fast and beautiful 60 frames per second in high resolution, without a single hitch. It’s as perfect a frame-rate you will ever experience in any 3D fighting game, making it a very sublime experience. Best of all, this HD release is easily the most perfect looking and performing version of Virtua Fighter 2, and you can’t help but appreciate such a flawless and effective utilisation of the old technology. Old school 3D games visually don’t age nearly as well as their 2D brethren, but Virtua Fighter 2 is easily among the exceptions. 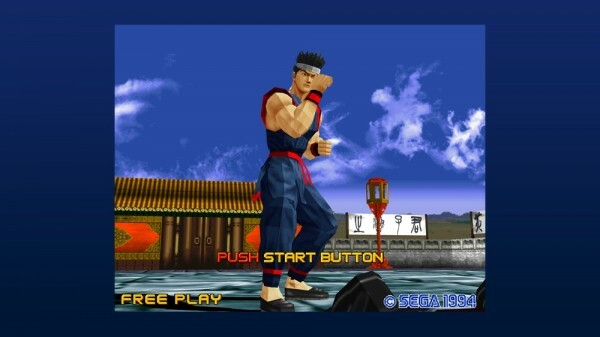 Virtua Fighter 2 features one of the most memorable soundtracks that Sega has ever produced. It easily has the best soundtrack in the Virtua Fighter series, featuring charmingly simple and catchy tunes that stay in your head. It’s varied, exhibits a lot of cultural influences, but more importantly it’s the classic 90s arcade sound with plenty of cool guitar riffs, thumping bass, synth-heavy techno beats, and some epic keyboards. Listen to the tracks like the dramatic (and manly) Ride the Tiger or even Dream Emperor of God and Fisherman from Seven Seas to get a taste of this enjoyable score. Just like how Street Fighter II continues to receive praise for still being the most fine-tuned, polished and refined 2D fighting game today, similarly Virtua Fighter 2 is as well defined and pristine a 3D fighting game can get it. Mechanically it is spot on, courtesy of the amazing frame-rate and precise hit detection. The controls feel so instinctively responsive, and it handles even better than Virtua Fighter 5: Final Showdown. Virtua Fighter 2 is one of those games that needs to be experienced to be believed, and as soon as you pick up the controller and literally melt into its superb fighting engine, you will understand why this game was (and still should be) such a big deal. In terms of gameplay, Virtua Fighter 2 is a truly intelligent and deliciously methodological fighting game, and it almost feels like you’re experiencing a fighting simulator. I can best describe it as a thinking man’s fighting game, one that encourages players to execute their offence with tact, as every movement and motion you make during bouts is crucial. If you’re going to go in mashing buttons and hammer away with random/repetitive attacks then you will be punished harshly for it, as this is a fighting game that’s all about smart execution of your repertoire, and not about being able to pull off the longest and fanciest looking combos. The character selection may be small here, but their play styles are tremendously different from each other. They each have an immense selection of moves and techniques, and more importantly they each demand a unique play style approach. Most fighting games allow you to apply the same basics with all of the playable characters, but Virtua Fighter 2 really forces you to understand and appreciate the unique intricacies of each fighter. The fighting approach you use with a character like Jacky is vastly different from the defensive and counter-based style of Akira. The depth in this roster is staggering and clearly demonstrates how the game was so far ahead of its time. Best of all, the character balance is perfect, bringing it all down to skill and wit. While the control scheme may feel simple, the fighting engine is anything but, as this is a very fluid and effortless combat system, one that continues to be emulated by games like Dead or Alive 5. Bouts in this game are quick, effective, and all about reactive play and timely execution. It may sound like a dense and complicated game designed for hard-core players, but it is far from it. Instead it’s actually more like Street Fighter II, where it feels like a game of rock, paper, and scissors. Subsequent Virtua Fighter games would get increasingly complex, but Virtua Fighter 2 is far more approachable while still offering compelling depth for those who want to go the extra mile. The only aspect of the gameplay that most likely won’t sit well today is the lack of fluid 3D movement. Don’t get me wrong, Virtua Fighter 2 is as 3D as they come, but it doesn’t have the full 3D movement that was first prominently introduced in Fighters Megamix and later really defined and perfected in the original Soul Calibur. That said it’s not something that will really ruin the experience for anyone, as the game offers plenty of evasive and dashing manoeuvres to keep the flow of battles interesting. The HD release has the arcade version in all its glory, looking and performing better than ever. The online mode on offer here is amazing, there are some minor hitches but nothing that really harms the flow of the battle, and in general it performs really well. The best part is that this game seems to have an active community right now. It’s very easy to find a variety of opponents, and hopefully the quality of this title and the network mode will lure more players in, and perhaps bring old school fans out of the woodwork. It truly deserves a thriving community. As it was in the case of Fighting Vipers and Sonic the Fighters, this HD release of Virtua Fighter 2 is arcade perfect, and so it is devoid of extra single player modes like a much needed training/practice mode. Having a training mode of some sort really would have been useful, especially for new comers, given how there is so much to learn and study. That being said, I suppose it does recreate the experience of traditional arcade gaming where players would be provided with a move list, and basically learn to properly implement those by doing. With so many opponents online at the moment, it’s quite fun learning as you go along and it really recaptures the magic of gaming at the arcades during the 90s. If you really must, you could always look for a cheap copy of the Saturn or PC port of the game, and put some hours into the training mode there. Virtua Fighter 2 is one of the most important video games ever produced, and a true hallmark for 3D fighting games. For a measly five dollars, you get to experience a timeless masterpiece with a fully functional online multiplayer mode to boot. Every gamer needs to purchase Virtua Fighter 2, and given its generously cheap price, there is simply no excuse to not to pick this one up and create an active and thriving online community for it. You can gloat about your Tekken Tag Tournament 2 and Marvel vs. Capcom 3 all you want, but you haven’t experienced a real virtual fight until you play Virtua Fighter 2.